Hey guys! So this is the lineage guild, where we take care of the relationships between cats and apprentices and mentors. So, even if you aren't in this guild it would be great if you could post all of your charries and the relationships or planned relationships they have with the other cats, including mate, father mother, sibling, mentor, apprentice, or enemy. Also please include any important ties your cats have with other characters not mentioned above. Thank you!!! Please tell me if I forgot anything!!! Blackpaw if now a warrior, and we changed Willowsong's apprentice to Lionpaw since everything got messed up and no one knew who's cat was who's apprentice/mentor. Do we make family trees here? okay so redcry of sunclan i said i want to be oliveferns mate if that is okay. i play as dragonblaze. can you explain autumns family more? seems confusing.... i think embersong should go with iceheart, they would be a cute couple aand they seem like a good pairing. fortunes mate will be emberkit of oceanclan, but later on. her siblings are darkkit, and tearkit and then later on, her half-sister, saffronkit. you should plan w/ shi about having kits in sunclan w/ maze and boar. fallen kits are solar and lunar, right? autumns kits are haze, soul, wild and mirage. i thought you already planned novas kits, w/ ice. artickit, dandelionkit, illusionkit and um someone else. roawnkit ca be mirrors apprentice and she will mate with darkkit. star might w/ azurepaw, my cat. ummm tigerstars apprentice is dancingpaw since i got rid of all my old charries when forestclan got deleted. we can plan our kits for sable and twister and jade and ebony here, tiger. So autumnstar and Fallenstar are sisters. So is Ravenqueen. Ravenqueen's daughter is Novafox, Ravenqueen had Novafox when she was an apprentice. Mazepelt is their half brother who they hate. Embersong is a cousin of Fallenstar, and Everstar is the mother of the element kits in ocean. Now, Embersong and Iceheart are perfect. You have fallen and autumns kits right, and Nova's kits are right except there is one more kit, I haven't decided the name yet. Sable isn't having kits, on purpose at least, and Jade is definitely having kits but idk the details. Can we work out jade and ebonys kits now? I want one to be fadedkit and another moonkit. Can olive have reds kits still because I want her to have a Nate. He can still die, but I just want her to have kits w/ him. If you really dont want to then I will find someone else. it would make more sense, time wise. also since we are in charge of families it seems fitting we are in charge of relationships so, i have decided to work and plan out mates for sun!!!! this is just what mating pairs i think there should be. I'm confused... Who's Embersong's mate now? How's that going to happen? By always training together? Yeah and they could just like each other. Here are the kits that are planned for my cats for the future. If you want one please tell me! Can I have Fawn, Shade, and Dawn? Wildkit is a she-cat with long, flowing fur that is a deep mysterious golden red, with flecks of a stormy grey and jet-black spots speckling her back, and sides. She has a creamy off-white chest and stomach, and her paws look like they were dipped in the moon, sparkling a breathtaking silver. Her tail-tip was dipped in the same silver, and her ears too, but her muzzle looks like a cheetah face, with the tears of jet black, and speckles and dark black rings around her eyes. Her eyes are just like her mothers, A deep frosty blue, that can be as cold as an icy wind, but as warm as a sparkling tropical ocean. Wildkit has extremely long fangs and claws, and when she is bored, she likes to sharpen them. She is tall but muscled, a spitting image of her aunt, Tigerstar. Although she is muscled, her tall form makes her slippery and very flexible, and her long tail makes her a great climber. She loves to fight, spar, and hunt, and is great at both. Even though she is an amazing warrior, she is true to her name. Wild, out of control, and very mischievous, she is the trouble child, and has problems obeying and answering to authority. Wildkit is very unpredictable and moody, but she is very funny and incredibly friendly. She is always sneaking off and mouthing off to her elders, and even though she is wild and unruly, she is incredibly loyal and will stop at nothing to become the best warrior she can be. A born leader, Wildkit leads her siblings into many problems, but her sweet face and good natured personality always seem to get her out of it. Hazekit: Hazekit has an unusual coat. It is a dark amber in color but has ripples and waves of a light gold. That's because the bottom of her fur strands are a dark red auburn, but the tips are dipped in a soft glowing gold, the mix creating an amber color. The fact that each strand of her fur is composed of two colors makes her pelt look like it sometimes has cheetah spots, and other times has a brindle coloring. The only past of her fur that isn't coated in this color are her claws, which, due to a generic defect are actualy a deep ebony. Her tail tip is also only dipped in red, but although it doesn't seem like it, her whole pelt is one "solid" color. Hazekit's eyes are as much of a mystery as her coat. They are as hard and gray as steel, but the have flecks of a light jade green in them, making them soft, at times. Hazekit is an explorer, not as big in personality or size as her sister Wildkit, but not as soft and calm as her other sister, Miragekit. She is proud and arrogant, but hates to obey other cats; unlike her sister, she jut slips off and doesn't do what she's told, whereas Wildkit would confront the other cat ordering her around. She only let's herself be led by Wildkit, and she often has visions from Starclan. Hazekit is a great hunter in the bright sunlight, unlike other cats, but in the forest, her bright and shifting pelt gives her away. Hazekit is very calm under pressure and is a GREAT herb hunter because of her nose. She wants to be a medicine cat very badly. She is quick witted, very intelligent, and not impulsive at all. She is an amazing fighter, but she sees herself as superior, and never spars unless to prove a point or scare someone off. She hates to climb and loathed swimming, and is a sarcastic, rude cat, but behind that rough polished exterior, is a soft and caring cat, friendly to friends, and deadly to enemies. So you want Dawn, Shade and Fawn, right? Also Tiger you mean that you want Shade and Haze be mates right and Fawn and WIld be enemies? Sure but for the Shade and Haze relationship you kinda need to ask Flame since it is her character now. Also Flame when you make the descriptions for them, try to make them have characteristics from their parents like blue eyes grey fur long tail bad hunter etc. Okay? Yes that's what would be awesome. And ocean, do you hunk it's possible for you to make a russetfur-like character for Rowankit? Like manly and brave etc? I was thinking that she should go with Darkkit. Um letsee I have some kits coming later but they might be too later, their parents are apprentices still! And one a kit. So no not them. Maybe I will pair up some freebies? Is that okay Tiger? Foxkit, eventually Foxhaven, is a dark red cat with a creamy gold belly and chest. She has earthy brown points and dark brown tiger stripes just light enough to be seen on her dark coat. She also has rings around her tail and striped legs of the same auburn brown. She has big blue green teal eyes with flecks of gray and rays of gold that glow in the dark, she is an amazing tracker with her long whiskers and big ears. She also has a great sense of smell and can see very very well. Foxkit is pretty much bipolar, she is outgoing with her friends and very quiet with strangers. She is very intelligent and sweet but loves to argue and is a bit of a flirt. She loves to spar, and hates heights but is a great climber. She loves to swim, and her dark red coat and brown stripes hide her well in the forest when she's hunting, so she loves to hunt. Foxkit's parents died of Greencough two winters ago, but she is very strong and doesn't like to talk about them. Foxkit has a hard time trusting cats, and is often daydreaming. She is pretty and quite a flirt, and bossy too, she gets her friends in trouble with her experiments and exploring, but always makes sure she is the one to take the hardest punishment. She is a born leader, and always dreams about leading her warriors into a winning battle. I would like Thistlekit. I can inmagine it- really dramatic medicine cat who looks a bit like Thistleclaw but is not a bit like Thistleclaw. Appearance: He's dark grey with very dark blue eyes. It's easy for him to hide in shadows. Personality: Wise, smart, good with battle tactics. Appearance: She's have light grey fur that looks light purple when the sun rises and sets. She has blue eyes. Sure Jay you can play as him and if you want you can play as the other kits Flame but I think I am okay for now. Make sure though that when you make their descriptions they have traits from their parents like red fur blue eyes etc. For now, I'll just wait and see if anyone else wants to play them. If no one does by next Saturday, I'll play some of them. And when I get back I might make some changes to their descriptions. Also powerplay when neccesary my characters, but if you can don't do anything that big decisions and such. okay. Well, I g2g. I'll see everyone next Saturday. So long and may Spiritclan light your paths. Rosefeather is ginger, former loner. Caring, female. Why did you do that Eagle? Aren't we supposed to be posting our charries here so we can work out the relationships and stuff? Umm. Sorry, I won't post everyone here.... Just their names. Ok I shall do mine then! I am going to put them in their future warrior names, just to let ya know. Oks so Wisteria is going to Grapefruit who Ice is going to make and they will have Scatterkit and Cougarkit. I am playing as Scatter. Wisteriafrost will die in whatever event it available after that. Ivory will have no mate. Plum is going to go with Burnt and they will have Starrykit and Lilackit, I play as Lilac and Starry is played by Ice. Jynx will go with Teardrop and they will have Shadekit and Angelkit(I think those are the names. i am not sure who is going to play as them) Rhapsodysong is going to die when Rainclan tries to invades Lavas island. Bubble is going to mate with Basilleaf and they will have Saffronkit but he will die too when Rain tries to invade. Dragonblaze is going to stay the deputy and will retire or die in a MUCH later event then now. Silver will mate with Holly before he dies. Myrtle mates with Jasper and they have two kits, Lynxkit and Seedkit. Olive has/is mated with Red and she will have Desertkit, Brackenkit, Leafkit and Mintkit. Twoflower and Jasper will die when Raiclan attack their camp, as well as Auburn and Apricot but they might mate before they die I am not sure yet. Coral will be a single medicine cat. Oceanstorm will stay deputy for a while and will retire when Star becomes leader and he will die peacefully sleeping as soon as he retires. Mocking will die when Rainclan Ambush her when they are trying to attack the camp. Jasmine and Azure will mate and they will have Fawnkit, Harekit, and Breezekit. Holly is going to mate with Silver and she will have two kits, Seakit and Thistlekit. Kite, Laurel, Bliss and Aroma might mate but totally later on when we have more kits. Vanila might mate but I dont think so she will stay single I think. I have no idea who play as my kits. And I have no real plans for them, well for some I do but no real plans. I dont know when the queens who give birht to these kits will die either. Okay so I'm making Ravenqueen be rainclan. Is there a deputy available for her? And can you post yor charrie with their Myra please so it's a bit more clear? Well if Raven is going to be Rainclan then make her be the leader when it becomes a full clan. We dont have a leader for that clan yet, and I was talking to you about saying that maybe you should the leader of the clan. Just know that the leader when we start is a male and is evil, and I think I will play as him, but later on at the final battle raven can kill him or some other character and she can become leader if that is what you want. Also BTW Rainclan is a alleycat clan that decided to move away from the twoleg place and attack the clans, when rogues joined them. So will Queen later on be Queenstar? Also you change names too much! Okay. The kits are in their birth order. Auburnclan-Dies during Rainclan War. Might have a mate. Apricotfur-Dies during Rainclan War. Might have a mate. Coralshine-Becomes medicine cat. Stays single. Death date unknown. Myrtlerose-Has kits and mates with Jasperhowl. Might die in the start of the second arc. Olivefern-Has kits and mates with Redcry. Death date unknown. Oceanstorm-Retires when Star becomes leader. Dies peacefully as soon as he retires. Jasmineflame-Mates with Azureshadow and has kits. Death date unknown. Azureshadow-Mates with Jasmineflame. Death date unknown. Vanillapetal-Might stay single. Death date unknown. Hollybell-Mates with Silvershadow and has his kits. Death date unknown. Thistlekit-Played by Jaybird. Becomes medicine cat. Silvershadow-Mates with Hollybell. Dies durin Rainclan War. Frostbreeze-Mates with Basilleaf. Dies during Rainclan War. Dragonblaze-Retires when Wildstar becomes leader. Death date unknown. Jynxpaw-Mates with Teardrop and has Shadekit and Angelkit. Death date unknown. Tearkit-Mates with Jynxpaw. Death date unknown. Ivorypaw-Becomes full medicine cat of Lavaclan. Stays single, most likely. Death date unknown. Wisteriafrost-Mates with Grapefruit and has Scatterkit and Cougarkit. Death date unknown, maybe in some future event. Whoo! That took some time!!!! Tell me if you want to play as anyone of my kits. Can jasmine have a fight with Nova because azure likes her? But she shuts him down and he realizes he loves Jasmine? Can Kite mate with Wind? Not Windpaw, Windkit. So I have an apprentice medicine cat, who is called somethingpaw. Could he not be evil, like he has a dream from SpiritClan which tells him RainClan is doing to wrong thing but the shadow of a queen will save them? Is the medicine cat apprentice really named somethingpaw? Only the queen's shadow will save you all from the torrential flood. 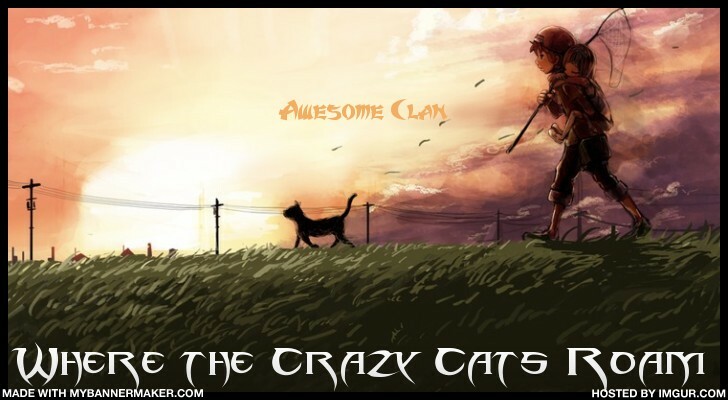 How would a alleycat clan find OceanClan, etc. if they are on islands in the middle of nowhere? How would they get there in the first place? No it's Waterpaw. I forgot it's name. I think that's a wonderful idea, Eagle! But really, how does RainClan get/find to the island?